Alex Katz, Elizabeth, 2011. Charcoal on paper, 15 x 22 1/2 inches. Courtesy of the artist and Richard Gray Gallery. Photo: Michael Tropea. Richard Gray Gallery is pleased to announce Alex Katz: Present Tense, a survey of six decades of master drawings by Alex Katz. An illustrated catalogue with essay by Yale School of Art Dean Robert Storr accompanies the exhibition. Totaling 70 drawings from across Katz’s ongoing career, the exhibition will occur simultaneously in Richard Gray Gallery’s New York and Chicago spaces. One of the most influential and widely known artists of the past half-century, Alex Katz remains, at age 88, a leading voice in American art. 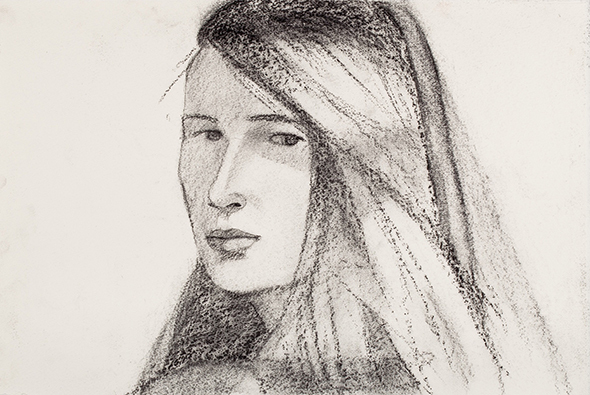 Alex Katz: Present Tense asserts the vital importance of drawing to the artist’s practice. Bringing together portraits from a span of 60 years, the exhibition reveals drawing as a place where the artist’s vision is explored, structured and recorded. A central facet of Katz’s work, drawing serves as a tool of immediacy that enables him to capture the present moment in line, tone and surface. The experience of the drawings, for both the maker and the viewer, is one of intimacy. The paper captures the artist’s hand in direct and unexpected ways. As Robert Storr notes in his exhibition text, these drawings are full of “monumentality and forceful graphic anomalies,” traits that show them as icons of Katz’s method and style. Storr not only traces the development of Katz’s drawing practice, but also sets him within a larger view of the European and American avant-garde in the modern period, showing Katz’s perceptual affinities with artists like Paul Cézanne, Georges Seurat, and Piet Mondrian. Like these artists, Katz uses drawing as a means of structuring his images, of putting them together line by line as an experience, not a resemblance. Alex Katz: Present Tense is the artist’s fifth exhibition with Richard Gray Gallery and follows a year of large scale museum surveys at the High Museum of Atlanta, the Guggenheim Museum Bilbao, and the Colby College Museum of Art. Works by Alex Katz are held in public collections internationally, including the Museum of Modern Art, New York; the Metropolitan Museum of Art, New York; the Tate Gallery, London; the Los Angeles County Museum of Art; the Art Institute of Chicago; and the National Gallery of Art, Washington, D.C. He lives and works in New York City.